Yes, I'm still alive! Just in the middle of graduating, finishing my dissertation, packing up our apartment, moving across the country and starting a new job! Whew! Makes for a pretty crazy month. :) Our pots and pans are mostly packed up now, but I made this fantastic chicken dish before all the craziness really set in. It's just the right amount of spicy, with creamy peanut butter, coconut rice, and crispy salad to cool things off. 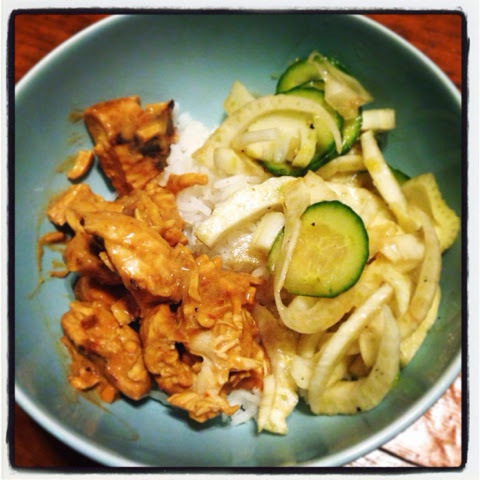 I love the combination of the tender chicken with crunchy fennel and cucumber...this dish hits all the right notes! I'm looking forward to cooking it again once we get our kitchen set up in Boston. And, if you have any recommendations for favorite spots in or around Boston, please pass them my way! 1. Make the rice. Bring 1-1/2 cups of water to a boil in a pot. Add the rice, coconut oil, and a generous pinch of salt. Cover, return to a boil, and simmer about 20 minutes, until the rice is fully cooked. 2. Make the chicken. Whisk together the honey, soy sauce, ginger, and coconut oil. Toss in the chicken tenders. 3. Heat a non-stick skillet over medium heat. Add the chicken and cook on both sides until nicely browned and cook through (3-5 minutes per side). 4. Make the peanut sauce. Stir all the ingredients together. Slice the chicken into bite-sized pieces, and toss with the peanut sauce. Taste and adjust seasoning. 5. Make the fennel-cucumber salad. Toss the vegetables together, and then add the remaining ingredients and toss to combine. Taste and adjust seasoning, adding more vegetable oil if the salad looks too dry. 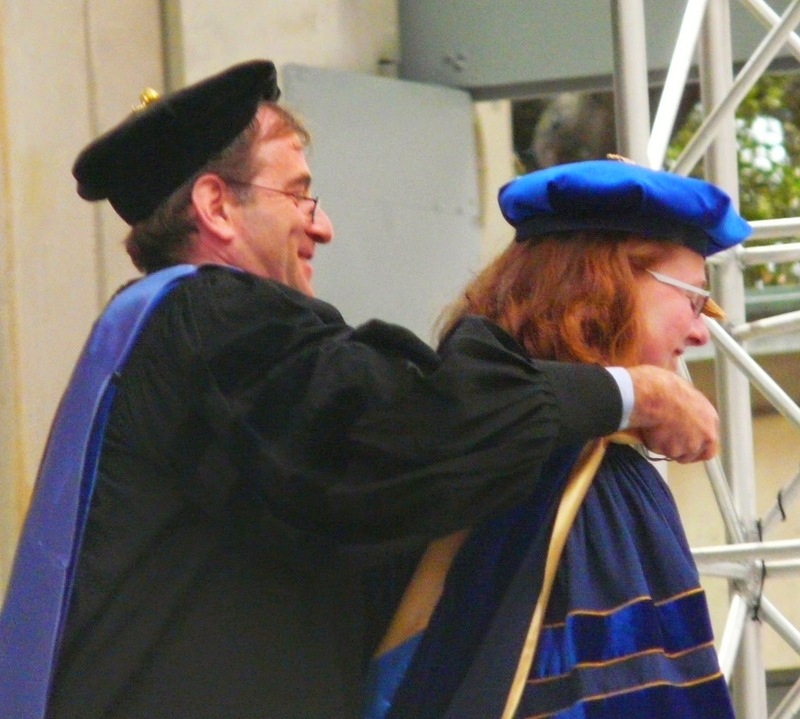 Here I am getting "hooded" at our graduation ceremony. Love the funny hats! Tim and I recently got together with some friends to grill on the deck at their apartment building. I brought this cake, and I think it's the perfect recipe for summer gatherings -- no fuss, easy to make ahead and transport, and delicious! 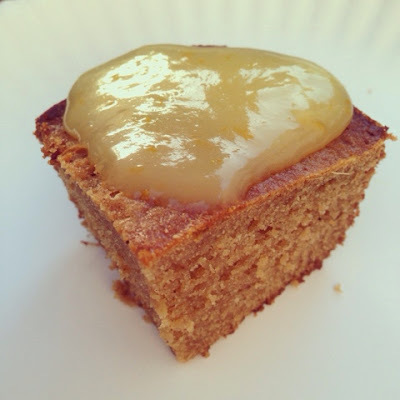 The fresh ginger adds serious spiciness, and the cake is super moist and tender. I absolutely love ginger cake with lemon sauce, but you could definitely swap it out for whipped cream (or even just a sprinkle of powdered sugar) if you prefer. The original recipe calls for molasses in place of the dark corn syrup, which would make this more of a gingerbread -- I used dark corn syrup simply because that's what we had on hand, and I liked the lighter flavor that really let the ginger shine through -- but, I'm sure either would be delicious! 1. Preheat the oven to 350 degrees. Spray an 8-inch square baking dish with baking spray, or butter and flour it. 2. Whisk together the flour, sugar, baking soda, cinnamon, nutmeg, salt, and cloves. Toss in the fresh ginger, and whisk to combine. 3. Stir together the melted butter and the corn syrup. Pour into the flour mixture, and stir with a rubber spatula until mostly combined. Add the water, and stir to combine. 4. In a small bowl, stir together the egg and buttermilk. Whisk into the batter until everything is nicely combined. 5. Pour the batter into the prepared pan. Bake 30-40 minutes, until a tester comes out clean. Let cool, and then slice into 16 pieces. Serve with lemon curd. This is one of those fast recipe where the whole is so much more than the sum of its parts. It's become a favoite in our house (i.e. tiny apartment) lately, partly because it requires little hands-on attention and partly because it is just so darn delicious! The prep on this dish is just cutting up a bell pepper and some scallions, and then cooking them up with frozen veggies. The timing is very flexible -- you can cook the peppers and scallions a little more or less, and then once you get everything simmering, you can keep it on low heat until the rest of the meal is ready. The recipe makes a ton, and the leftovers are excellent. You can easily take this in a bunch of different flavor directions -- the original recipe adds a little Dijon mustard, making for a great side dish for burgers or fish. You could also try adding whatever fresh (or dried) herbs you have on hand to take things in a different direction...maybe lots of fresh basil and some dried Italian seasoning to make this a good side for chicken parm? Either way, this recipe is definitely a winner! 1. Melt the butter in a large skillet over medium-high heat. Add the bell pepper and the white part of the scallions. Season with salt and pepper. Cook for 5-7 minutes, stirring occasionally, until the veggies are starting to soften and brown. 2. 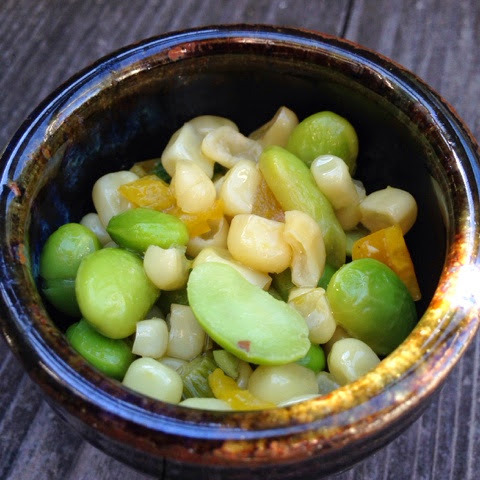 Add the edamame and corn (no need to thaw), along with 1/4 cup water. Stir in the mustard. Simmer for about 10 minutes, until everything is tender and nicely mingled. 3. Stir in the green parts of the scallions and serve. I love love love spinach-artichoke dip. There's something that's just so decadent and delicious about it...but then it has vegetables in it, so I can lie to myself and feel at least 3% virtuous. 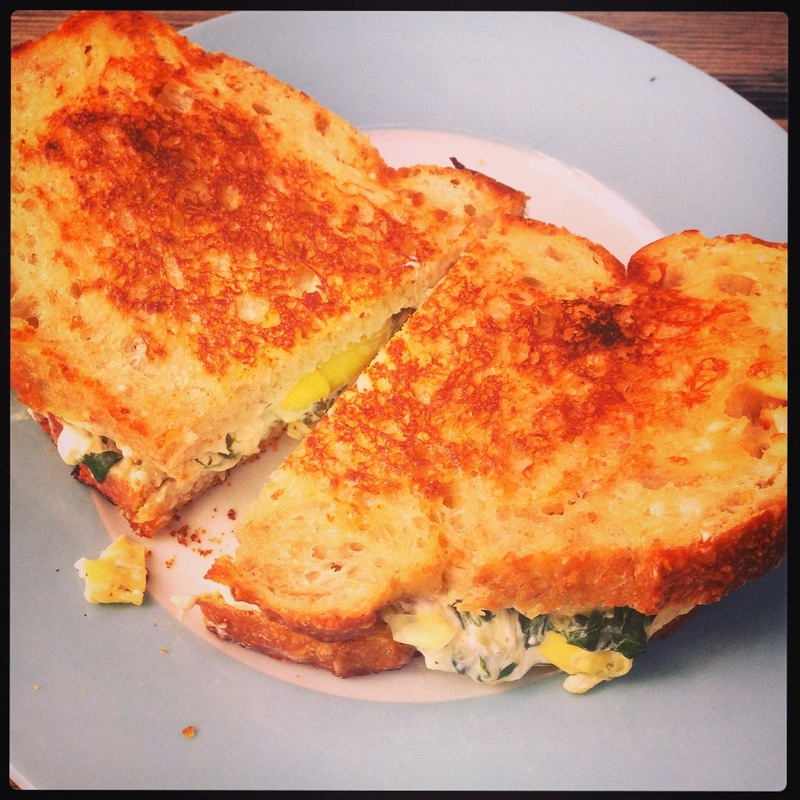 :) This sandwich combines all the best things about spinach-artichoke dip into a slightly more portable form. Plus, you really can't go wrong with toasty, crispy, golden-brown bread around a creamy, cheesy filling. This is definitely a rich sandwich, but it is so delicious...I highly recommend treating yourself with this beauty next time you need a pick me up! 1. Steam the spinach until wilted. Let cool slightly, and then squeeze out as much liquid as possible. Chop coarsely. 2. Combine the steamed spinach, artichoke hearts, Neufchatel cheese, feta cheese, and mozzarella cheese in a bowl. Season with salt and pepper, and stir to combine well. 4. Heat you skillet over medium heat -- you can work in batches, or heat up two skillets to fit all the sandwiches at once. For each sandwich, layer a piece of bread (mayo-side-down), a quarter of the cheese mixture, and then another piece of bread (mayo-side-up). Cook the sandwiches until golden brown on both sides. If the cheese seems to need help melting, you can pop a lid onto the skillet for a few minutes. My partner for this month's Secret Recipe Club was Angela of Spinach Tiger. Her site is full of recipes that made me really hungry! Although Angela has a wide range of tasty recipes, for some reason I was really drawn to her side dishes...she has a definite talent for coming up with sides with an interesting twist. I was tempted by her blue cheese cole slaw and maple bourbon baked beans, but ultimately decided to try her Parmesan honey biscuits. These biscuits are amazing! The dough comes together easily, and I love the folding/rolling method...it's an easy way to create flaky biscuits that just melt in your mouth. 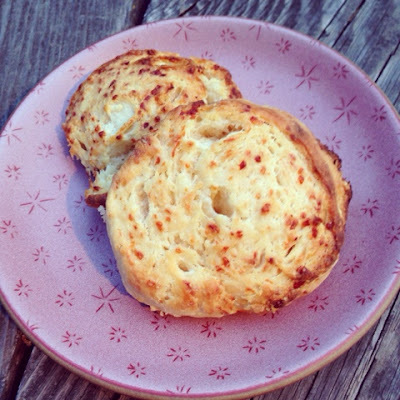 The Parmesan really steals the show here and adds amazing flavor to the biscuits, along with a little sweetness from the honey. I find some biscuits don't keep very well, but these are great cold the next day if you happen to have any leftovers. We enjoyed these biscuits alongside pork tenderloin and roasted apples, and it make the meal extra special. Thank you Angela! 2. Preheat the oven to 400 degrees. Line a baking sheet with parchment. 3. Whisk together the flour, baking powder, and salt. Add the Parmesan, and whisk to combine. 4. Cut 6 T of butter into the flour mixture. Drizzle in the honey, and then add the buttermilk and stir to create a sticky dough. 5. Flour your work surface and hands, and knead the dough about 8 times (don't overwork it). Pat it out to about 3/8 of an inch. Sprinkle the remaining 2 T cold butter on half the dough, and fold the dough in half so the butter is in the middle. Roll the dough up into a log. Cut into 10 rolls. 6. Arrange the biscuits on your prepared baking sheet, and bake 12-15 minutes, until golden and cooked through. I was recently up in Seattle for a conference, and also got the chance to visit with my aunt, uncle, and cousin, as well as some friends in the area. Win-win! My aunt and I made this amazing vegetarian dish for dinner one night...well, to be fair, my aunt mostly did the cooking and I stirred up the yogurt sauce. :) I have really enjoyed recipes from Yotam Ottolenghi and Sami Tamimi's two newer cookbooks (like this Israeli stew and these lentil galettes), but I'd never gotten a chance to look at their first cookbook -- it is definitely going on my wishlist! This dish has quite a few components, but the combination is absolutely amazing. The base is a chickpea-tomato stew that's spiced with cumin and coriander. The stew is topped with honeyed sweet potatoes, which are pretty much the most delicious thing ever. The honey makes these reminiscent of a marshmallow-sweet potato casserole, without being over-the-top sweet. And, pairing the sweeter potatoes with the savory stew is really lovely. Finally, a tangy yogurt sauce cuts through the richness of the sweet potato and makes for a perfectly balanced dish. Yum! 1. Soak the chickpeas overnight with the baking soda. The next day, drain and rinse the chickpeas, place in a large saucepan, and cover with water. Bring to a boil, and simmer 1 to 1-1/2 hours, until tender. Add more water if needed. When tender, drain and set aside. 2. Make the sweet potatoes. Place the potatoes in a wide saucepan with the water, butter, honey, and salt. Bring to a boil, and then simmer 35-40 minutes, until the potatoes are tender and the liquid has been absorved. Flip the potatoes halfway through to ensure even cooking. Remove from heat and cover to keep warm. 3. Meanwhile, make the sauce for the chickpeas. Heat the oil in a large skillet, and add teh onion, cumin seeds, and coriander seeds. Fry 8 minutes, stirring often, until golden brown. Add the tomato paste and stir for a minute or so. Then add the tomatoes, sugar, and ground cumin. Continue cooking about 5 minutes over medium heat. Taste and season with salt and pepper. 4. 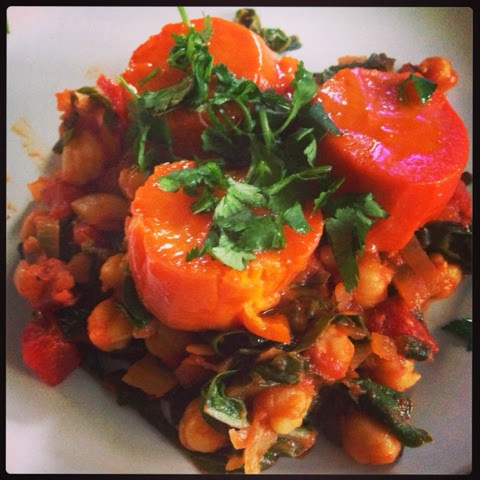 Stir the chard into the tomato sauce, along with the cooked chickpeas. Cook for another 5 minutes, taste again, and adjust seasoning as needed. 5. Make the yogurt sauce. Whisk together the yogurt with all the other yogurt sauce ingredients. Season with salt and pepper to taste. 6. To serve, spoon the chickpea sauce into a serving dish. Arrange the sweet potatoes on top, and garnish with the cilantro leaves. Spoon the yogurt sauce on top before serving.